This country as, in the time of the Romans called Lusitania. 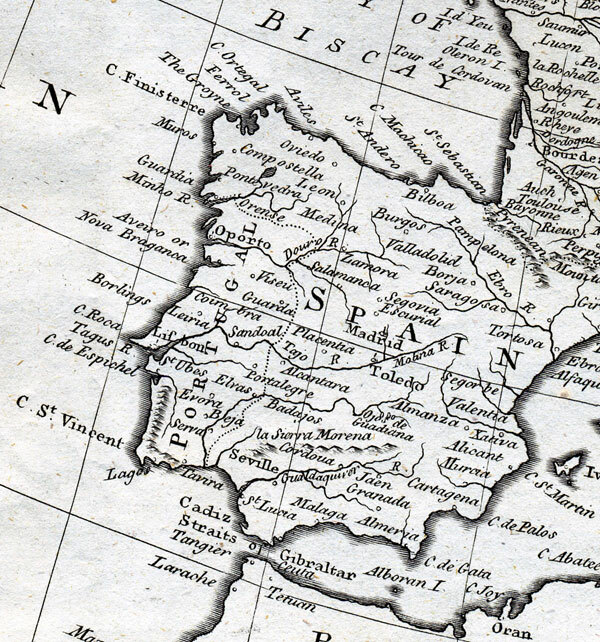 The etymology of the modern name,Portugal, is uncertain. It most probably is derived from some noted harbour, or port, to which the Gauls ( as strangers are called in the Celtic) resorted. Portugal is situated between thirty-seven and forty-two degrees of north latitude and seven and ten degrees of west longitude; being about seven hundred miles in length and one hundred n breadth. It is bounded by Spain on the north and east and on the south and west by the Atlantic ocean, being the most westerly kingdom on the continent of Europe. The climate of this country is most excellent and salutary. At Lisbon the days of fair weather are computed to amount to two hundred in the year and those of settled rain seldom exceed eighty. The medial heat is generally about sixty degrees. The air, especially about Lisbon, is soft and beneficial to consumptive patients; it is not scorching as that of Spain but refreshed form the sea breezes.